The Delaware County Fair got a hand this year from Delaware Area Career Center students who helped with landscaping, making storage racks for animal cages, and designing the fair magazine. DACC landscaping instructor Gary Kessler said Thursday that his students and students from the DACC equine program spent time working on the infield, including mulching and trimming the Little Brown Jug hedges. Brad DeMent, DACC’s welding instructor, said his students designed and created two storage racks for the small animal committee at the fair. “Six seniors worked on design, layout, cutting, fabrication, welding, and finishing the project,” DeMent said. He said the racks would hold the rabbit cages and chicken cages once they are broken down and put in storage. He estimated his students spent 20 lab hours on the project. DeMent said the project was a good exercise for his students. He added that these scenarios allow students to work effectively and apply their skills to a real-world situation. DeMent said the project was a “win-win” for the DACC and for the fair. 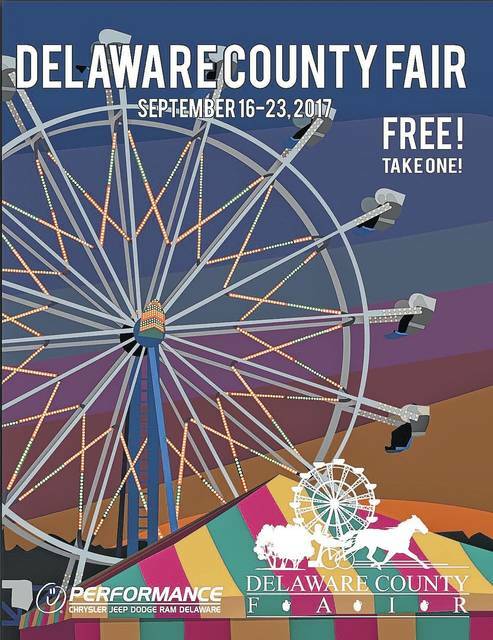 Wil Rowland, one of the digital design instructors at the DACC, said three of his students were tasked with designing and creating the Delaware County Fair Magazine for this year’s fair. Rowland said the students began working on the project on and off from early February to mid-June and said it was incorporated into part of their grade and class work. Ceci Clark, a senior in the digital design program, was the lead designer on the project and worked with seniors Caleb Hawk and Zach Hinkle to create the magazine. Clark said she and the DACC students were given a lot of freedom with the project. Clark said the project was a great experience. 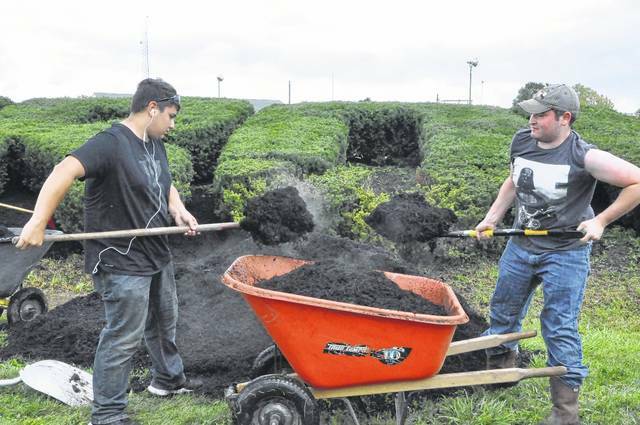 Delaware Area Career Center seniors Christian Meehan and Zach Pugh load a wheel barrow full of mulch Thursday at the infield of the Delaware County Fairgrounds. The Delaware County Fair Magazine was designed by Delaware Area Career Center students studying digital design and has been in production since last semester. The students and their instructor said the project was a great learning experience.